The Spring/Summer Consignment Sale will be held on March 30, 2019. 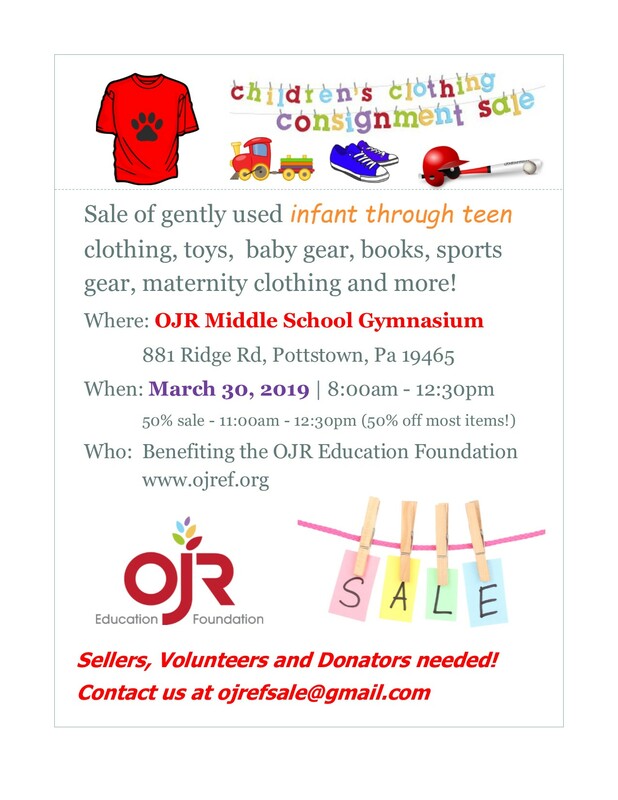 To sell children’s items at the OJR Education Foundation sale and earn a rate of 70% of your total sales. The Education Foundation will earn 30% of the seller’s total sales. The Education Foundation provides funding for the mini grant program for all OJR teachers. Seller: A person who wishes to sell gently used children and teen clothing and other items. After registering a seller will be assigned a number and can then prepare items for sale using the Education Foundation tags. Sellers receive 4 passes for the presale. Sellers are responsible for working a two-hour shift during the sale or set up. All sellers are expected at 12:30 for clean up. Seller numbers may be reused for future sales, however, seller numbers that have been dormant for 4 consecutive sales will be reassigned. Donator: A person who wishes to donate clothing or children’s items for the sale may donate it to the Education Foundation. Volunteers will tag the items and prepare it for the sale. The donor can request one presale pass and is not expected to work during the sale. Donators are not required to register. (If you are able to tag your donated items for the sale you will be eligible to receive more presale passes.) Please email us at ojrefsale@gmail.com if you are interested in donating. REGISTRATION information will be available in January 2019.